Hartford is certainly a town not lacking in pretension. A city built on stolid insurance premiums grown glossy and sleek on nouveau riche investment swindles. There are grand boulevards…devoid of traffic. Vast public spaces…abandoned. Towering skyscrapers…seemingly vacant. It’s as if the Rapture came and it turned out that God’s chosen were insurance adjusters and derivatives traders. And the bees of course. Which if you kept them all in a smallish enclosed space would be okay by me. Granted, a cool and drizzly work night might not fully capture the bustling energy of the place. And on the plus side, there’s plenty of on-street parking. Still, it all feels a little Potemkenish, a city built for a population that had other ideas entirely. After Manhattan’s crowded vitality, this feels a little like Pyongyang without the whimsical dictatorial lunacy or nuclear ambitions. Just that creepy insurance watchtower lighting up the night sky. Sitting for what felt like an hour at an abandoned four-way stoplight left me feeling like the last man on earth. Stopping on the yellow, I watched as the lights cycled through one…street…at…a…time. Then a leisurely wait for nonexistent pedestrians. As I near retirement age my turn finally arrives, and a lone jaywalker appears from the mist to amble out in front of my bumper before stopping to check his laces. I race through under the yellow, drive a block and stop again while the remaining minutes of my life tick….slowly…away. Photographed May 27, 2009 in Hartford, Connecticut using a Hasselblad 2000 with Rodenstock 3x loupe on Fuji Neopan 400 black and white negative film. This entry was posted on Friday, December 23rd, 2011 at 4:50 pm. 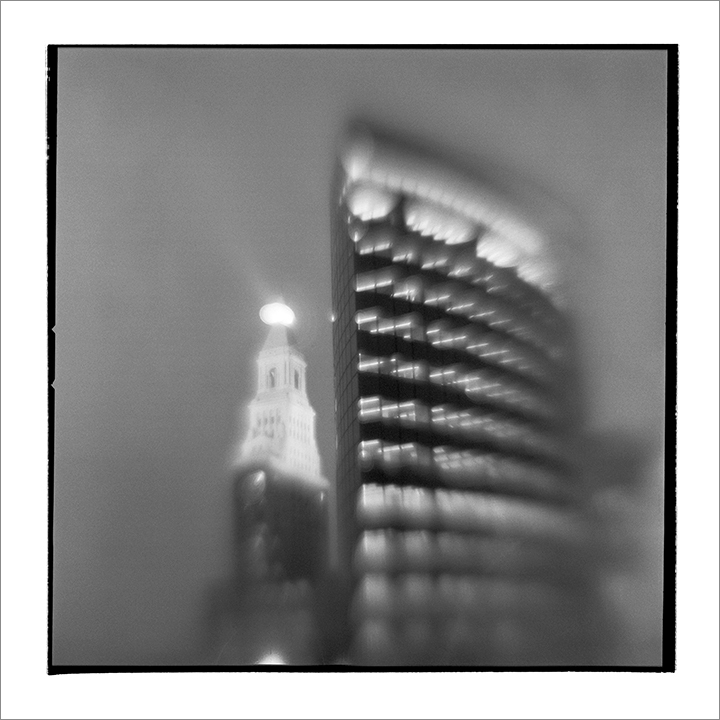 It is filed under Monochrome and tagged with Americana, Architecture, Black and White, Blurry, Connecticut, North America, USA. You can follow any responses to this entry through the RSS 2.0 feed.